McCook Community College hosted the “Transgender Voices” tour conducted by the Nebraska American Civil Liberties Union Tuesday. McCOOK, Neb. — A transgender farmer credits a supportive community and her Christian faith with helping her adjust to life as a woman while maintaining her role as a farmer, volunteer firefighter and parent. 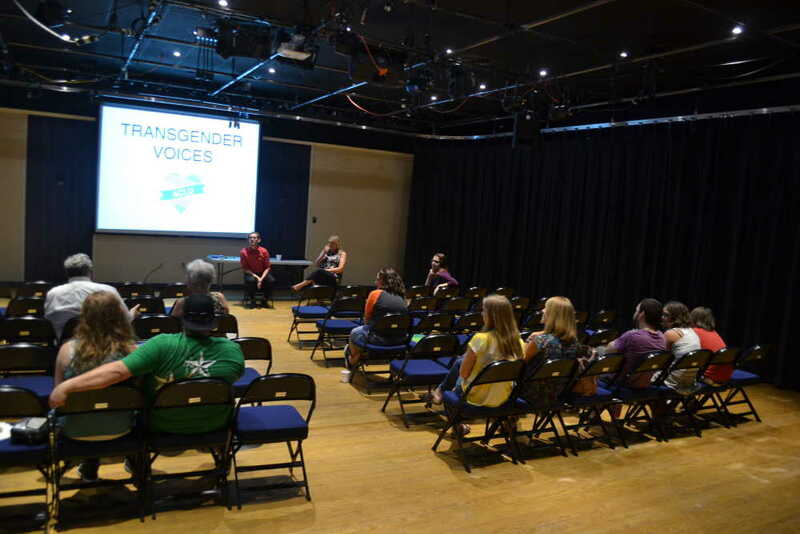 That doesn’t mean it was easy, Ashley Swartz of Malmo, Neb., told a small group Tuesday at McCook Community College’s Weeth Theater, during “Transgender Voices” tour conducted by the Nebraska American Civil Liberties Union with other sponsors. As early as age three, “I didn’t feel I was trapped in the wrong body,” she was just expected to live a life she didn’t understand. She tried to model other boys and her father, Ashley said, but “felt like God abandoned me” by letting the devil place the desire to be a female in her head, despite her prayers to the contrary every night. Despite abilities in the usual small-town Nebraska sports, she fell into a depression, lots of drinking and what was later determined to be a disconnection. “This is so wrong,” she told herself on the way to a wedding with a woman, but her spouse couldn’t “fix” her, and only counseling prevented a fall into full-blown alcoholism. “I didn’t want to transition,” she said, and lacking a gun or other means, decided on using a rope in a farm equipment shed to end her struggles. Only thoughts of her children’s pain stopped her long enough to “pray to God, and I felt his presence,” Ashley said. That experience gave her the self-confidence to proceed with the transition to a female, as well as a new caring attitude for fellow human beings. There have been adjustments, of course; including staying in farming, safe from being fired and supported by bankers willing to look no farther than the loan balance sheet. At first, she was afraid to go to the grocery store, and she did encounter one volunteer firefighter who said he might have trouble depending on her while responding to a fire. Merchants seemed puzzled over her qualms, and are now accepting, however, and she was soon soon responding to fire calls as usual. There was a new relationship with her children — who had to adjust to their mother dating another man — and deciding what to call their former dad, now a female. “Oh, you’re Brandon’s Aunt,” another parent said at a sporting event where her son was a participant. No objections on Ashley’s part. Her daughter, younger when the divorce occurred, wasn’t aware who her biological father was. In response to a question, Tyler Richard of the Nebraska ACLU, who moderated the meeting, used the Star Trek television show as a model of what he envisioned as an ideal society. With some exceptions, characters who populate the Enterprise find ways to work together, despite their differences, he said. Those differences are “not a reason to fight but a reason to celebrate,” he said. Should conservative Christians be able to express their opinions openly, a man in attendance asked. The ACLU is a rights-based group, not a group formed to advance a particular population, said Richard, who said he was a homosexual male. “I’m a Christian myself,” Swartz added, believing in the transforming power of that faith. Videos highlighted both Ashley's story, and that of Devon, a transgender man who grew up in Scottsbluff. The tour included stops in Scottsbluff and North Platte as well as McCook. Sponsors include Planned Parenthood of the Heartland, Bold Nebraska, Panhandle Equality, Community Services Fund of Nebraska, Nebraskans for Peace and Revel. I cannot judge the Eternal outcome of a 'T-G' situation, as, Eternal Salvation is determined, between the individual, and God. They, of a 'deviant lifestyle' from mine, is a Choice only they can make, as 'must all,' in acceptance or rejection of the Christian Faith, without condemnation, nor, IMO, acceptance in 'Fellowship,' as my understanding and Spirit leads me, to my Judgment, and my Reconciliation for my own Sin (Covered by the 'Blood of Christ, on the Cross'). We need to love our neighbor, but we cannot be required to 'accept, or promote, deviation from following the 'Contract of Marriage,' Comprised in the 'Bible.' Everyone on Earth must make their own Choice.